Ebola virus swarms the surface of a host cell in this electron micrograph. 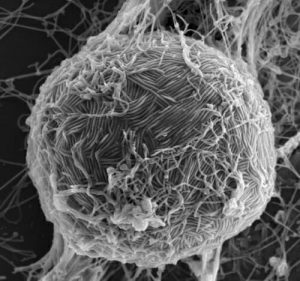 Like most viruses, Ebola requires the help of a host cell to survive and replicate. Photo by Takeshi Noda, University of Tokyo. A whole-virus vaccine to confront Ebola, the rare but often fatal hemorrhagic disease that periodically erupts in sub-Saharan Africa, may soon be one step closer to the clinic. 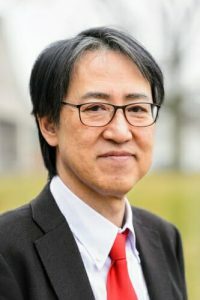 With the help of experts at Waisman Biomanufacturing, within the University of Wisconsin-Madison’s Waisman Center, UW-Madison School of Veterinary Medicine Professor Yoshihiro Kawaoka will lead a $3 million effort to produce as many as 1,000 doses of an experimental vaccine that has already been proven to work safely in monkeys. “The goal is to produce a safe and effective vaccine against Ebola virus for people,” says Kawaoka, a world expert on Ebola and influenza. The vaccine is planned for use in a phase 1 clinical trial in Japan and is the only whole-virus Ebola vaccine candidate under development. It will be produced at Waisman Biomanufacturing, a specialized facility whose mission is to help translate scientific discovery into early-stage clinical trials. The staff of the facility provides expert help with manufacturing processes, quality control and overall product development in addition to regulatory support. The technology behind the new Ebola vaccine was devised nearly a decade ago by Peter Halfmann, a research scientist in Kawaoka’s lab who is also an expert on the Ebola virus. It is known as “Delta VP30,” and is a form of Ebola virus that is noninfectious and safe to work with under routine laboratory conditions such as those at Waisman Biomanufacturing. The virus is missing a critical gene – one of only eight genes that make up the virus genome – that makes a protein the virus needs to reproduce in host cells. Vaccines work by exposing the immune system to viruses or parts of viruses. The Delta VP30-based vaccine may offer better protection against Ebola virus than others in the pipeline, Kawaoka says, because it is a whole-virus vaccine. Other Ebola vaccine candidates use vector viruses to ferry a single Ebola protein, a surface antigen, to prime the immune system. “Here, we have a whole-virus vaccine that presents all the viral proteins to the immune system, which may result in increased and broadened immune responses compared to vaccines that present only a single viral antigen to the immune system,” Kawaoka explains. The need for an Ebola vaccine is acute. Periodic outbreaks of the disease in sub-Saharan Africa, including an epidemic between 2013 and 2016, caused major loss of life and serious economic disruption in the three countries where it occurred: Sierra Leone, Guinea and Liberia. The new vaccine project will be the subject of an informational meeting to be held Feb. 27 at 4:30 p.m. at the Friends of the Waisman Center Auditorium on the first floor of the West Annex. The Waisman Center is located at 1500 Highland Ave. Free parking is available after 4:30 p.m. in Lot 82, behind the Waisman Center and accessible from Highland Avenue. This story was first published at news.wisc.edu.